Tough Win was given far too much to do in the home straight as Sing Sing Cat ran away with the KRA Cup Classic on a gorgeous autumn afternoon at Seoul Race Park today. 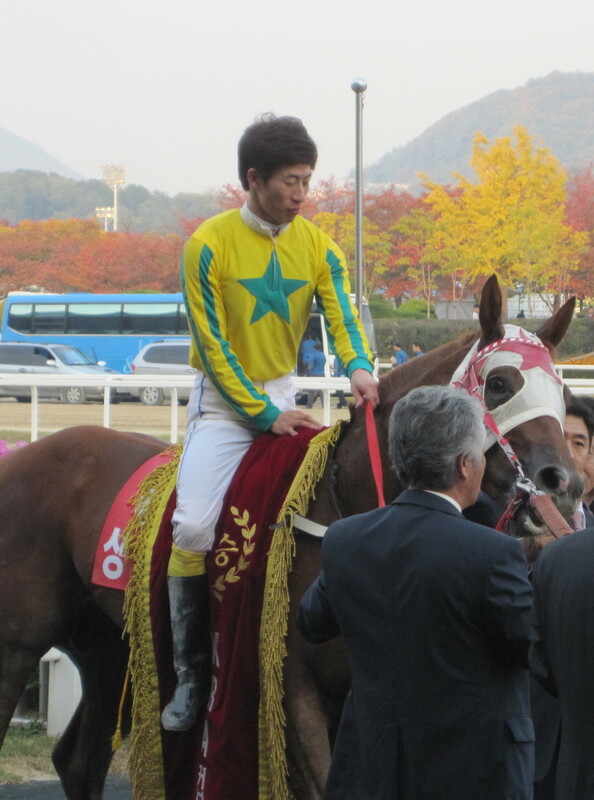 Grand Prix champion, number one horse in Korea and long odds-on favourite, Tough Win (Yonaguska) was, as has been normal in his recent races, sent straight to the back of the field. Meanwhile Ace Galloper (Chapel Royal), winner of this race last year, made the running with Sing Sing Cat (D’Wildcat) close behind. Generally Tough Win quickens at the end of the back straight, this time, however, jockey Cho Kyoung Ho didn’t ask the five-year old to begin improving his position until they came off the final corner meaning he had to go right around the field to get a run. While he made up 11 places and more than 25 lengths in the home straight, Sing Sing Cat was travelling too well to be caught and held on to win by a length. Three-year old Nolbu Manse also managed to resist Tough Win, although had the race been a few metres longer – or had the favourite been asked to improve a little earlier – things could well have been very different. Sing Sing Cat [D’Wildcat-Freddy Fenter (Fenter)], a four-year old colt, moves on to 9 wins from 20 starts and puts himself right into contention for the season ending Grand Prix in December. Tough Win will no doubt be back that day although different tactics will be needed if he is to avoid another ignominious defeat. Down at Busan, the first of the year-end Juvenile championship races got underway in the form of the Gyeongnam Sinmun Cup. And there was a surprise as 14/1 shour Pureun Energy (Menifee), one of only two fillies in the race scored a narrow victory. Last year’s winner Gyeongbudaero went on to win one Classic and finish second in another. Pureun Energy may or may not live up to that, however, in the short-term, she has won herself a spot in the Breeders’ Cup at Seoul next month where she will race for overall champion juvenile honours. Choi Kyoung Ho rated the speed of race very badly, Tough Win is a tough good horse but not a superman that can fly in a short straight of Seoul. No need to settle down 3 lengths behind the second last horse and leaving the run too late. Should have taken off at 600 mark. He should better watch C. Williams’ ride on Dunadeen in Caulfield Cup and get some ideas about settling at the back of the field. Agreed. Against those kind of horses, I assumed he would improve in the backstraight and be no worse then 6th or 7th coming round the final turn, especially as he only just got up to beat Jumong and Haedongcheonwang after being left plenty to do last time. Arrogant ride. You put it well: too arrogant.